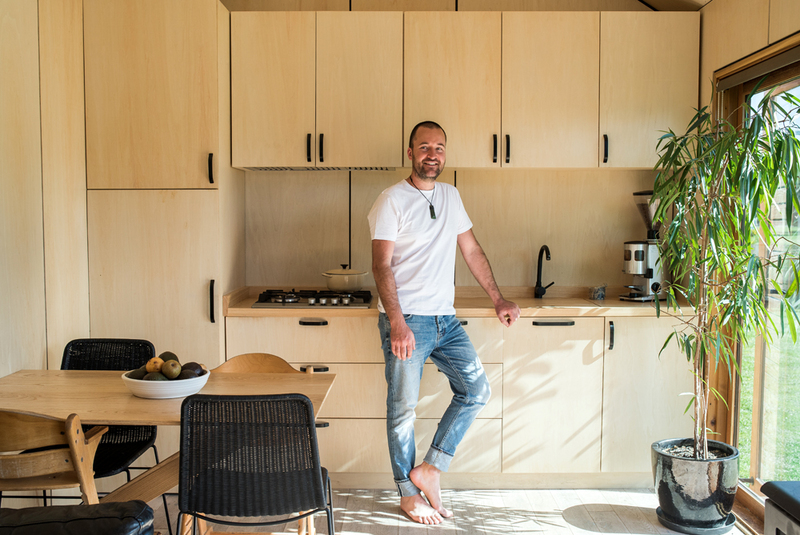 We recently visited a friend and supplier of ours, Francois from Le Workshop, and his wife, Sarah-Lee, in their amazing tiny home that Francois built himself here in Napier, Hawke's Bay. 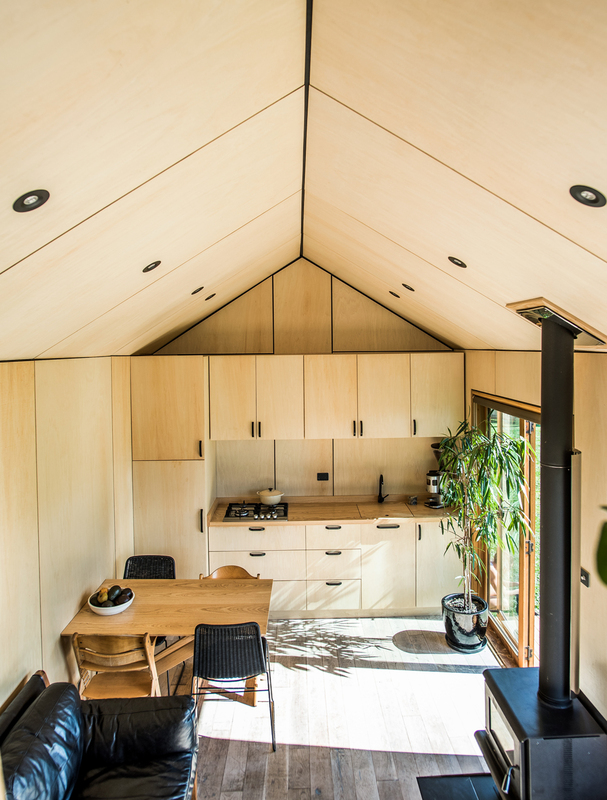 Measuring only 7m x 3m, the house is made from American cedar outside, with plywood inside and American ash on all the trims and the window seat. The couple share the house with their three gorgeous children, Poppy (8 years), LouLou (5 years), and Francis (3 years). Although the two girls are currently attending a local primary school, Francois and Sarah-Lee plan to homeschool the kids next year. They're excited to take a holistic approach to their children's development and teach them real life skills. The couple bought the land 1 1/2 years ago, but Francois' has had a workshop on the site for some time, so he was very familiar with the location. The workshop is next to the house, so there was already power to the site. The kitchen has gas hobs, and is cleverly designed to make the most of the small space. The fridge is cleverly hidden behind the ply cabinetry, and the sink has a board that sits snugly on top to create extra bench space when needed. With such compact living, life is all about every day needs. "We think twice about what we buy," says Sarah-Lee. "The kids blocks are just as important as our special books." Tucked behind the bookshelves are the kids' bunk beds, with Francois and Sarah-Lee's bedroom above on the mezzanine floor. "Upstairs is like a second living space," Sarah-Lee tells us. "The whole family often watches the sun rise together up there in the morning". To the side of the kids' space is the tiny bathroom complete with shower, composting toilet, and a little basin. The tiny home has many advantages, including being able to clean it from top to bottom in 10 minutes. The double glazing and wood-burner fire keeps them cosy warm. "We went from having a $400 monthly power bill in our last home, to $25 a month, and that's in winter," says Sarah-Lee. Francois and Sarah-Lee have created an enviable lifestyle for themselves. Francois is a highly talented joiner and cabinet maker, and he shapes surfboards. He is also a bee keeper; he and Sarah-Lee grow their own veges, make their own honey and wine, and Sarah-Lee is a potter and teaches piano. Not to forgot the kids who help take care of the family's bunnies and sell the babies on TradeMe or by word of mouth. They have a 'rabbit account' which pays for the food and teaches the children about economics - life school. Behind the tiny house are two large sheds, one is Francois' workshop and one houses the washing machine, bikes, and extra winter gear. This allows the family to keep just what is necessary in the house itself. Francois has built several other tiny structures and has had a lot of interest in his own home. If you would like him to build something similar for you, please get in touch with him, he would love to hear from you. Whether it's your home, your bach, a studio or sleep out, we can absolutely vouch for his superb workmanship.